Stamps and Stitches: Thanks, Girlfriend! A few weeks ago my friend Jin sent me the most amazing Hello Kitty care package. If you didn't know this, I do love me some Hello Kitty. I asked her to pick up the Hello Kitty date stamp at Michaels for me, since I have no Michaels nearby, and she picked up a bunch more! Journals, tapes, embellishments, bookmarks and MORE. I'm a grown-up for the most part, but it's still fun to get a surprise in the mail! So I wanted to make her something special to show my appreciation. Since Jin isn't a quilter, I felt somewhat confident making her a quilted pillow. I had my doubts through the whole thing, like I do with pretty much every project, but I sent it anyway and she loves it! 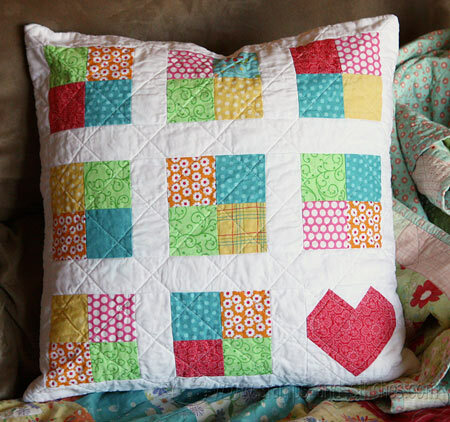 Here's the pillow I made using simple 4-patches and a heart patch from EQ, plus some white sashing. Fabrics are all from my stash and some were leftovers from other quilts. and I made this super simple card for her too. I always want to use these cute mini clothespins from SU but they don't fit well in an envelope so this was the perfect opportunity. What a pretty quilt pillow. I like. Dang! I wish I'd been the one to send you Hello Kitty stuff!!!!! LOVE this pillow - it's smashing! SO pretty!!! Love that CAS card too. I have a bunch of those tiny clothes pins and yes, they're kinda hard to put in a regular envelope to mail. Wow! What a great pillow! Quilting is something I have been afraid to try because it seems like precision is key. But maybe trying it on a smaller scale like this would be doable. Thanks for stopping by my blog today and your sweet comment! Wow, your pillow is beautiful. I really like the heart at the bottom:) How could she not love this, it is beautiful and a quilt of any kind is such a precious gift from the heart. You card is equally beautiful. I like the background. Love the cushion! What a lovely surprise that must have been for her! What a cute pillow and I love the card! I have scraps from a quilt I am making and will make my first pillow quilt. Thanks for sharing this! What a beautiful gift you made for her... both the pillow and the card. Wow Gale! What a fantastic thank you gift and card! So adorable! I love that pillow and what a great surprise. I love getting surprises too. Great fun. GORGEOUS! LOVE the pillow and totally love the card! Cute! Love both the cheery pillow and the card! Very creative! oh my i love them both!!!! both simply wonderful!! Oh my goodness Gayle! Love your adorable pillow and precious card! What a super cute pillow. I love your card too. 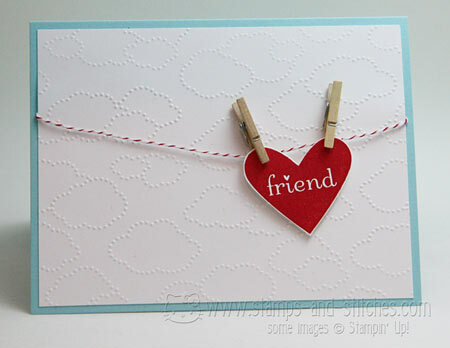 Mini clothespins are some of my favorite embellishments although I don't get a chance to create enough with them.